From accurate Clarifye eye exams and contact lens fittings, to laser vision correction consultations and advanced evaluations for eye diseases, our optometrists provide comprehensive eye care to patients of all ages. Call Dr. Krietlow and Associates for all your eye care needs. We’re conveniently located inside LensCrafters in Blaine and Saint Cloud, MN. 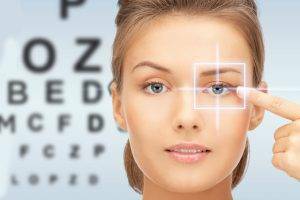 Learn more about what problems can be spotted with an eye exam at our Lenscrafters location, what’s involved in a comprehensive exam, and special considerations for kids and contacts. Dry eyes result from the chronic lack of lubrication and moisture on the surface of the eye, which can cause minor irritations, an inability to wear contact lenses and an increased risk of corneal inflammation and eye infections. Our Lenscrafters location in Northtown Mall carries Restasis ® and punctal plugs to treat your dry eye syndrome.